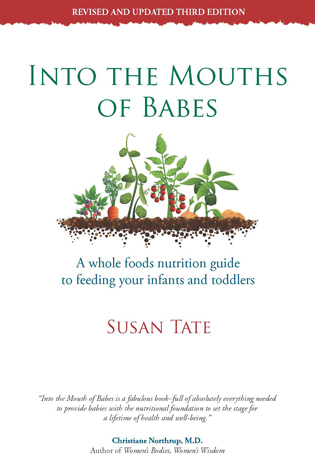 As many of you know, my first book, Into the Mouths of Babes, was published in 1984. But it seems a year later I had another book in mind. 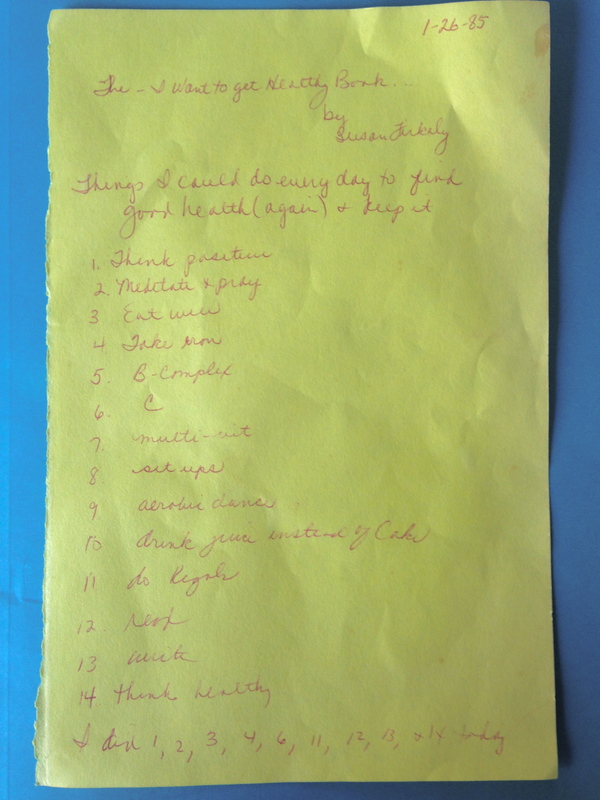 My daughter recently came across this piece of yellow construction paper with a list I wrote in 1985 of 14 things I could do every day to find good health and keep it. (We still can’t figure out how it ended up in her treasure box of memorabilia.) As you can see, the first line reads: The – I Want to get Healthy Book by Susan Firkaly, (my former name). I chuckled when I read the list since so many of the things I wrote then have become part of the wellness work I have been sharing for the past 45 years! In my picture of myself as a modern mother of my generation, I was probably wearing a Wonder Woman cape. Well, underneath the cape was a woman with a constant flow of stress-related illnesses. I had colds, sinus infections, the flu every year, a stomach ulcer, IBS, anemia, and had tubal ligation surgery in 1983 that almost killed me when the doctor hit an artery. On top of all of that, I had a series of whacky accidents. I totaled my car a half-mile from our house on December 24. No, it wasn’t icy; I just went off the one part of the beautiful country road–actually actually attempting to avoid an accident–and hit a cement culvert rather than just dirt. It caused my car to flip over, smashing it as it landed sideways across the two lane Virginia road. I had a serious neck injury and minor bruises. Angels were with me, truly, and I shall take this opportunity to remind everyone “seat belts save lives!” And, oh yes, you might want to know I was on my way to the DMV to get my driver’s license renewed. In the early 90s I began working at the University of Virginia. But the Wonder Woman cape offered no protection from several years of uterine problems. I ended up having a hysterectomy—the surgery complicated by a blood clot in my lung. So you can see, I was not the vibrantly healthy and happy dancing woman you know today! Why am I sharing this now? Because I don’t want any of you to attempt to take care of everyone else but yourself—the way I did then. The only way I felt I could get taken care of was through illnesses and accidents. It was TOTALLY subconscious. Feeling in a rather reflective mood lately, I just wanted to let you know my wellness path had quite a few twists and turns (think knee twisting and a car turning over) and your path may have had–or be having–some bumps too. The list I made in 1985 was a pretty wise one! 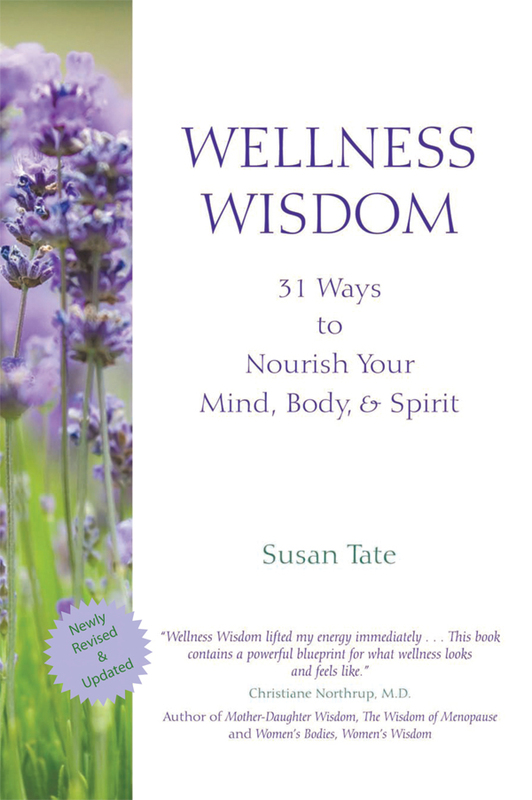 In fact, I just realized that although I didn’t write that book back then, much of it was poured into my fourth book, Wellness Wisdom: 31 Ways to Nourish Your Mind, Body, & Spirit (2007, 2009). So, here’s the list of the 14 things I wrote on the yellow construction paper on January 26, 1985 along with my comments from today in italics. 2. Meditate and pray ~ Today I would move this to number 1. 3. Eat well ~ But of course. 7. Multi-vit ~ 4 – 7 cracked me up, as I am the vitamin taking (and selling) queen! Nine years ago I wisely partnered with a top-rated global nutrition company, USANA Health Sciences, and now I share these supplements with those who are a good match for them. I am a good match—as my last 9 years have been my healthiest years ever! 8. Sit ups ~ I haven’t done sit ups in years! But I “play” with my abdominal and core muscles all the time through my Nia practice. It’s much more fun than sit ups. 9. Aerobic dance ~ Now, Nia friends, doesn’t this just make you smile? In 1997 I discovered the joyful, somatic, and yes, aerobic, dance/fitness practice of The Nia Technique. 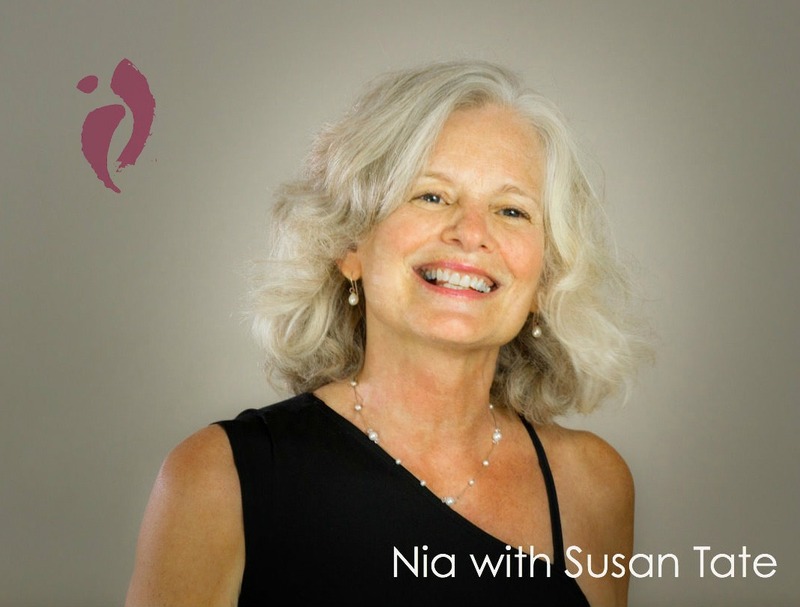 Nia has been a vital part of my vibrant health and in-shape-not-sore-anywhere-strong-65-year old body! 10. Drink juice instead of Coke ~ Yes, I was a Coke (Coca-Cola!) addict for 2 decades! Yikes! It was my drink of choice. I loved the caffeine, I loved the sugar, I drank more than you could every imagine me drinking. 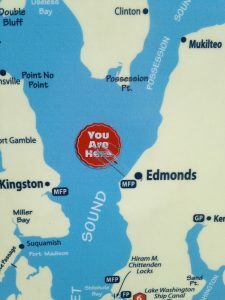 Then, one day, on my way back from Portland after attending my Nia Blue Belt Intensive Training, I just stopped. And today, I advocate water instead of juice—there’s just too much sugar in the juice. I enjoy eating the whole fruit (with the fiber still in tact and no added sugars) instead. 11. Do Kegals ~ Oh, yes, and so many other pelvic floor strengthening exercises too! 12. Read ~ I know I put that on that list because I was only reading non-fiction, professional research-based books and articles at the time. Now I also, finally, read purely for pleasure. 13. Write ~ Doing that, loving writing, will stop only when I’m dead. 14. Think healthy ~ Oh, the research on this one is another book in itself! (I recommend any books or YouTube videos by Bruce Lipton or Mario Martinez on this topic.) Our beliefs control our health way more than our genes do! BACK TO YOU: What’s on your list? Is there anything you’d like to put on your list to add to your self-care and expanded wellness? I’d love to hear from you–you can leave a reply below. I’d also love to support your wellness path through coaching or through answering your questions about what vitamins you might want to take. 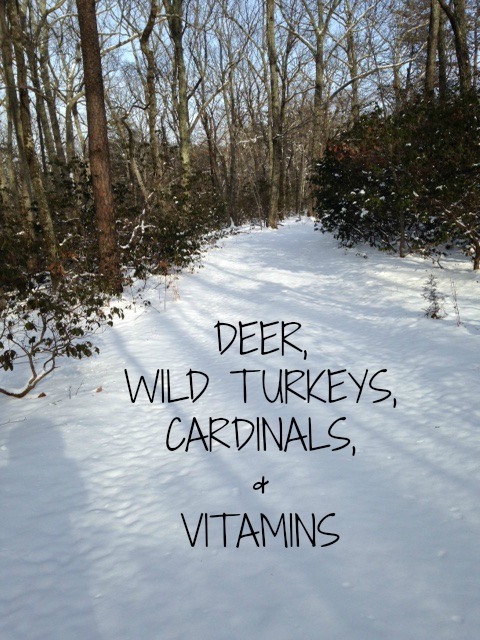 if you want guidance on selecting vitamins. This entry was posted in getting healthy, mind/body/spirit, Nourishment, relaxation, stress reduction, supplements, vitamins, wellness, Wellness Tips and tagged Nia, nutrition, self-care, vitamins, wellness on June 11, 2015 by Susan Tate. 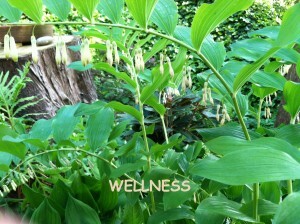 You may have heard me mention that wellness is communicable! As each day passes, I am even more excited to share my work in its many forms. Recently, I became aware that some of you may not know all the things I offer. Please let me know how I can serve you! This entry was posted in mind/body/spirit, Nourishment, supplements, vitamins, wellness, Wellness Tips and tagged Nia, nourishment, nutrition, vitamins, wedding officiant, wellness on March 5, 2015 by Susan Tate.